John Golding, the artist, art historian, critic and curator, will be the subject of a major symposium at the Courtauld on Friday 4th and Saturday 5th December 2015. Featuring speakers including artists Philip King, Richard Deacon and Jim Mooney, and academics Chris Green, Dawn Ades, Elizabeth Cowling and Sarah Wilson amongst many others, the event promises to be a serious critical evaluation of Golding's many and diverse contributions to the art world. 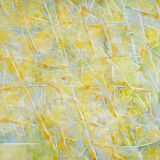 At the start of 2015, Piano Nobile exhibited a major monographic exhibition of John Golding's earliest abstract canvases at the gallery in Kings Place, Kings Cross. Presenting works from the 1960s, most of which had not been since for over forty years, the John Golding: Finding the Absolute showed Golding at the outset of his life long pursuit to realise the absolute in abstraction. For further information on the symposium please visit the Courtauld's website here. For further information on John Golding please click here. To book a ticket for the symposium please email the gallery.